A Cadbury Creme Egg in its original form is absolute perfection. Variations, like the new Twisted chocolate bar, simply play around with the chocolate-to-cream ratio. As a lover of the sweet inner creme, I'm partial to the larger Cadbury pieces- the chocolate becomes simply a means to scoop all that deliciousness into one's mouth. I can't complain about the creme egg minis, especially because I tend to go with the theory that candy is more fun in miniature (as long as you've got a lot). That said, I still prefer the chocolate-creme ratio of the larger eggs or Twister chocolate bars. 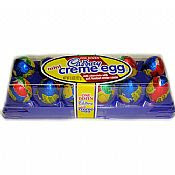 The limited amount of creme in the mini centers is more prone to dry out, as well, and what's the fun of a Cadbury Creme Egg that's lost the Ooze? Then again, the great packaging on these is clever and fun. Thanks for tracking these down, Dan!